Thursday, 24 January 2019, 11 a.m. – 12:45 p.m.
Thursday, 31 January 2019, 11 a.m. – 12:30 p.m.
RSVP to secure a Special Event Ticket. Tickets will be required to access CR1. American society is fractured, along economic, racial and partisan lines. Today we don’t even believe the same facts. But this did not start in 2016. In their new book, Fault Lines: A History of the United States Since 1974, Princeton historians Kevin Kruse and Julian E. Zelizer trace nearly five decades of division. They start the story in 1974, when Watergate, the defeat in Vietnam, racial conflict and economic convulsions began an unsettling new political era. Please join us for the launch of Energy Kingdoms: Oil and Political Survival in the Persian Gulf, the next book in the Center on Global Energy Policy Series published by the Columbia University Press. Author Jim Krane, Wallace S. Wilson Fellow for Energy Studies at Rice University’s Baker Institute for Public Policy, traces the history of the Gulf states’ energy use and policies, looking in particular at how energy subsidies have distorted demand. Krane expertly lays out the hard choices that Gulf leaders face to keep petro-states viable in a world increasingly focused on combating climate change. Guests unable to attend in person can view a livestream of the event at energypolicy.columbia.edu/livestream. The adoption of the resolution 73/25 “International Day of Education”, co-authored by Nigeria and 58 other Member States, demonstrated the unwavering political will to support transformative actions for inclusive, equitable and quality education for all. The Annual Meeting in Davos, titled ‘Globalization 4.0: Shaping a Global Architecture in the Age of the Fourth Industrial Revolution’, remains the foremost gathering of top leaders from politics, business, civil society and. In the true “Davos Spirit”, the aim is to advance these agendas with bold ideas and exciting opportunities to consider in the year ahead. On 22-25 January in Davos, the SDG Media Zone will host conversations with world leaders, economists, influencers attending the World Economic Forum. January 22 will be a big day for the ILO, as daylong celebrations marking the start of its 100th anniversary begin with the launch of the Global Commission report on the Future of Work. View online coverage. UNHCR announced a new global campaign calling on people all over the world to cover the distance travelled by refugees each year. The 2 Billion Kilometres to Safety campaign invites people to act in solidarity and run, walk or cycle to achieve a cumulative total of two billion kilometres. Participants can use their fitness apps or the campaign website – www.stepwithrefugees.org– to log the kilometres and contribute to a global total. High school students around the world between the ages of 16-19 are asked to submit a short blog post on what could help better prepare them for the future. Youth will be most affected by the changing nature of jobs and skills and we believe they will have some interesting ideas about the opportunities that technology can provide them. Please share this with your networks so that we may hear from young people on their ideas on how to re-imagine education. Apply here by 31 January 2019. Deadline is 31 January 2019. 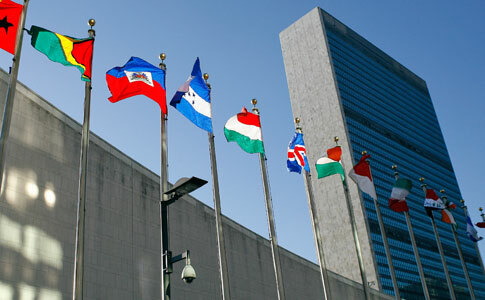 The above UN news and events was made available through the UN Department of Global Communications Civil Society Unit. Subscribe to DGC NGO Relations Announcements and E-mails here.